In a world that is so much about what you have accomplished and what you have, humility can definitely seem to go against the grain. But then, aren't we as Christians supposed to go against the grain too? I tend to think of myself as a fairly humble person, but I could certainly always use that help. This page was really just a focus on that reminder. 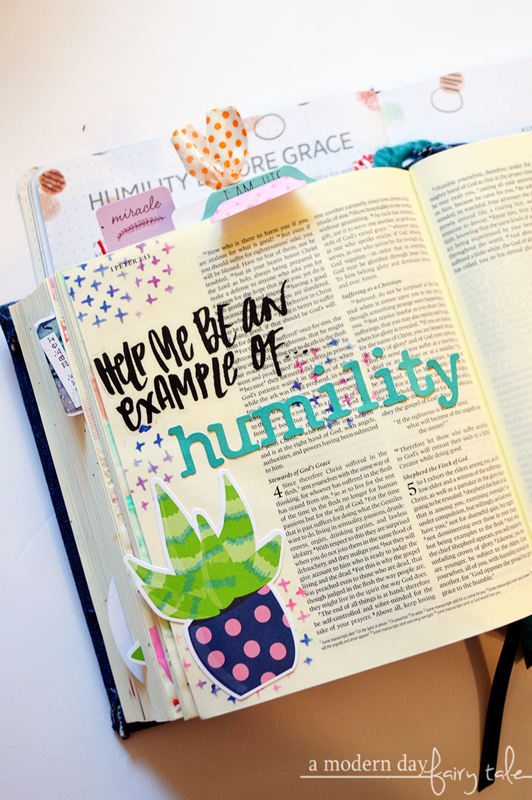 A prayer to God asking for help in being that example of humility that we are called to be. I created a simple background with a stencil and multi colored inks, added some stickers and topped it off with a cute plant die cut. I think perhaps one of the hardest concepts for us to wrap our minds around is that idea that Christ truly does forgive each and every sin. Oftentimes we refuse to forgive ourselves, so how then can a perfect God forgive us? But He does, and talk about a freedom in knowing that! This page I really wanted to focus on that idea of freedom. 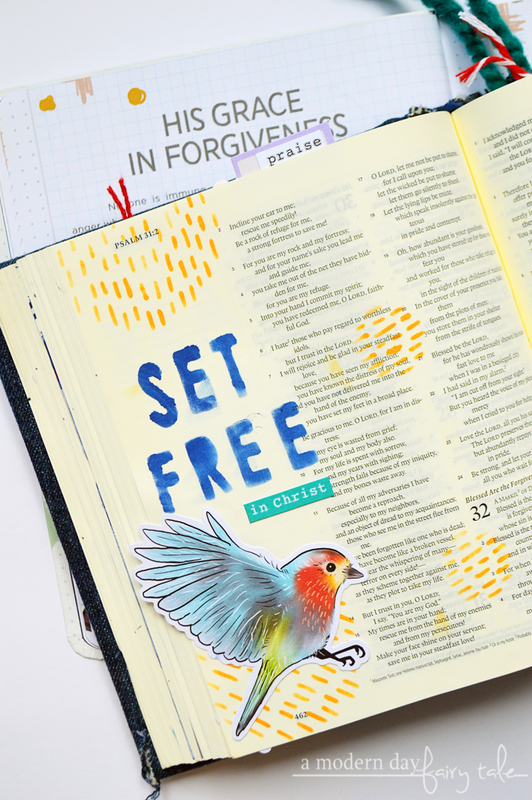 I created this page around this die cut of a bird in flight- the ultimate visual of what it means to be set free. I picked up the oranges and blues from this image and used those to create the finished look. I feel like this message really kind of went along with the same idea of freedom as the previous devotion. But again, with such a hard concept to grasp... we need that drilled into our heads! I know I do! So, I really liked that these went together so very well. For this page, I really wanted to celebrate that idea. 'He saved us'. Three words that hold such a meaning. I kept the elements quite simple here but because it was at the end of a book, I enjoyed having all that extra space for larger elements. This is perhaps my favorite entry from this week. Day 11: Grumble or Grateful? Have you ever seen that quote, "Have you prayed about it as much as you've complained about it?" As I read through this devotional, I was reminded of that quote. It's a great question though, right? It's so easy to take to social media or call up our best friend and just lay it all out there. And hey, I've been there too. I think sometimes getting it out is beneficial... but not NEARLY as beneficial as taking it to prayer. For this page, I really wasn't sure where I wanted to go. 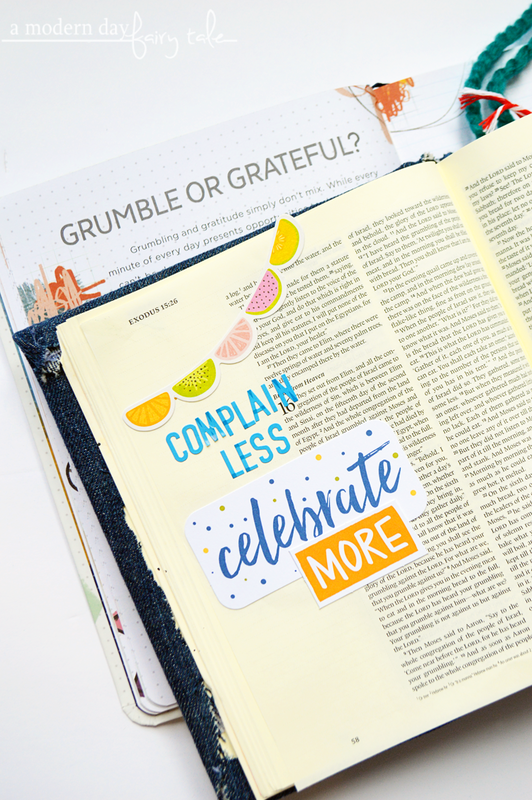 As I searched through my supplies these 'Celebrate' and 'more' die cuts were right next to each other and I couldn't help but think that was some divine inspiration. So I ran with it! I added a fun banner to get that celebratory feeling to finish off the page. As I was reading this, I found myself starting to wish that I HAD been able to journal through this back in November with the rest of the community as I'd planned. Oh, the great fall themed pages this could have produced during that season of thankfulness. But then isn't that the point... not JUST to be thankful during that season, but during all seasons? So instead, I was able to create a fun spring-like page celebrating being thankful ALWAYS. Every day. I created a fun watercolor look background using gelatos and layering on some stunning floral die cuts. 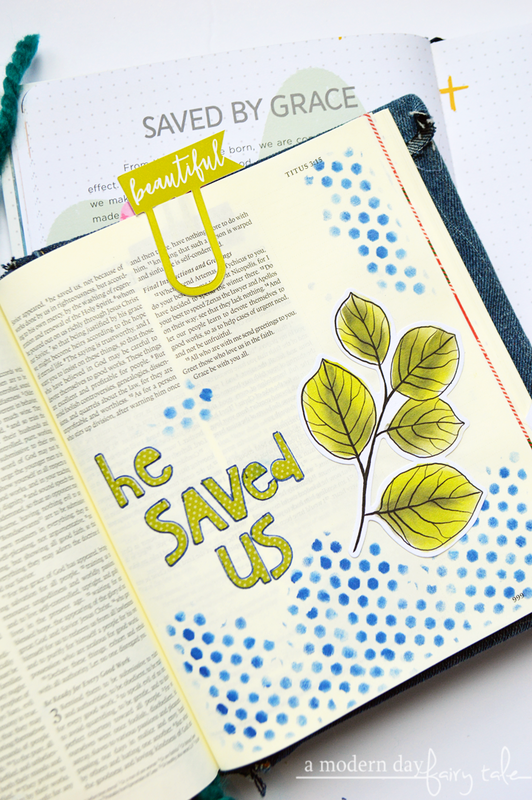 I found an old stamp set from a previous Illustrated Faith devotional kit (I believe November 2017) that worked very well with this simple message. There is nothing I love more on Sunday mornings than the worship service during church. Letting go of my troubles for the week and just singing out His praise! Oh the power of praise!! 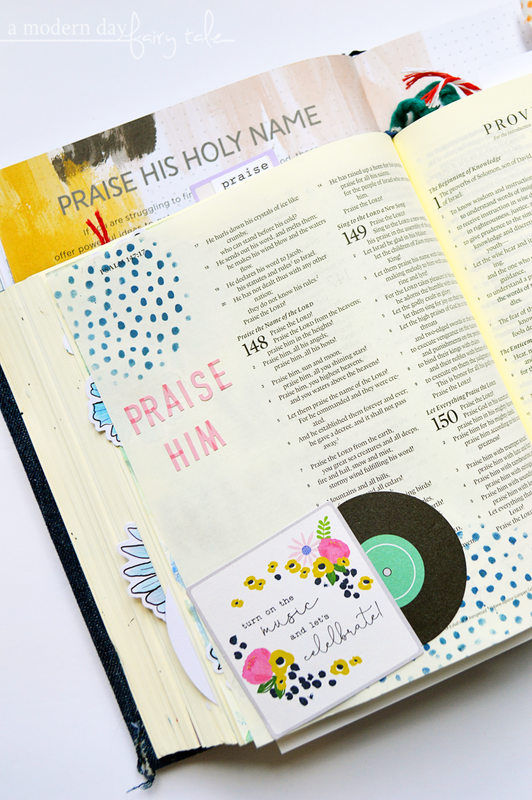 As I read the title of this devotion and the included verses, I knew I had just the perfect die cut for this page! This fun little record player from the Jen Hadfield My Bright Life Collection was the perfect fit. Turn on the music and celebrate! While this piece was not made with praise in mind... isn't that all praise is? Celebrating God? Praising His name? Earlier in the week we talked about giving thanks every day. 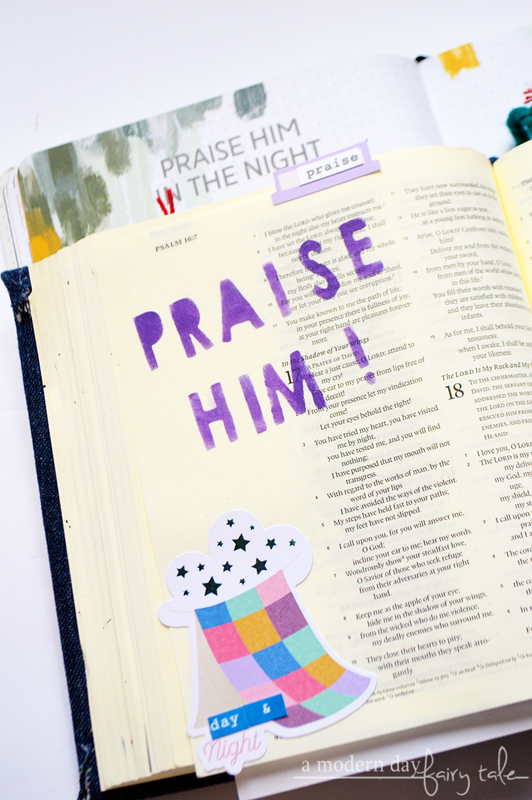 And on Day 14, we talked about praising him no matter the time of day...or night! I loved this message because it reminded me that we are ALWAYS to praise him... both in the literal day and night and in the good times and the dark times. It's a pretty loaded message when you really start to think about it. 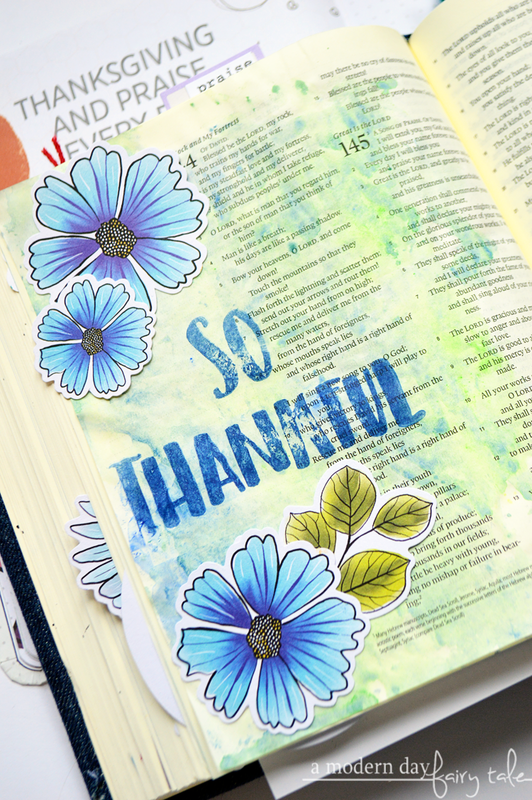 In the past, I have mostly stuck to Illustrated Faith die cuts and those intended specifically for the purpose of Bible journaling or that were otherwise faith related. The reason for this is that often these other die cuts would include either images or phrases that were otherwise more difficult to incorporate into my journaling...and I hate leaving pieces unused. Recently though, I had the chance to expand my collection and decided to branch out a bit. In fact, all of the die cuts featured in this post except TWO are from that little shopping spree. This allowed me to add some variety... but also meant I had to get a little creative. This is an example of that. You see, this little tent actually says 'girls night'. I thought it was the perfect image for this page and had intended to just trim off the words, but instead realized that by covering with some stickers, it gave it a fun look while perfectly portraying the intended message. So, all that to say...don't be afraid to branch out and get creative! !